A woman looks at the tombstone of her elder brother, who died in 1951 during the Korean War, at a national cemetery in Seoul. South Korean leader: "Goal is not military confrontation"
(CNN) -- North and South Korea marked the 60th anniversary of the Korean War with sober commemorations and sharp rhetoric as tensions continued to ripple between the two countries over the sinking in March of a South Korean warship. North Korea -- which took the opportunity to blame the United States for causing nearly $65 trillion in "human and material damage" over the last six decades -- continued to ramp up its rhetoric, accusing America of "persistently antagonizing" the country over the sinking of the Cheonan. South Korea blames North Korea for the sinking, which left 46 people dead, but Pyongyang hotly denies the claim. 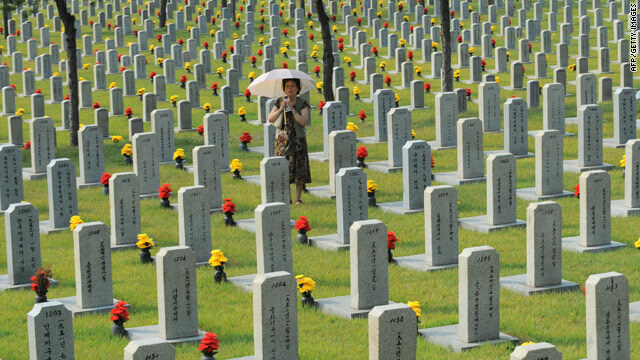 Top South Korean officials on Friday urged the North to stop its provocations as they honored the war dead at ceremonies. The North Korean People's Army invaded South Korea on June 25, 1950, in what would become known as the Korean War. The fighting ended on July 27, 1953, when an armistice agreement was signed. Since there has never been a peace treaty, the Korean War has technically never ended. While there have been efforts over the years to defuse hostilities and pursue peace and stability, great anguish has emerged over the Cheonan, which South Korea says was sunk by a torpedo. At a national ceremony on Friday commemorating the start of the war, South Korean President Lee Myung-bak urged North Korea to stop what he says are military provocations. The Yonhap News Agency quoted him as saying, "Our ultimate goal is not a military confrontation but peaceful reunification." In another ceremony in South Korea, Defense Minister Kim Tae-young said, "the Cheonan incident reminded us of the sad reality of the divided South and North." Yonhap quoted Gen. Walter Sharp, the top U.S. commander in South Korea, as saying North Korean provocations would be deterred. "True peace cannot exist when North Korea resorts to force and violence," Sharp is quoted as saying. "The North Korean leadership must know that any further provocations will be dealt with swiftly and decisively." North Korea's Korean Central News Agency, meanwhile, cited an article in the North's ruling party newspaper, Rodong Sinmun, that said the South Korean government is trying to escalate a confrontation with North Korea. "They are working with bloodshot eyes to ignite a war while crying out for 'retaliation' and 'punishment' of someone with the 'Cheonan' case as a momentum," KCNA said, citing the article. North and South Korea presented their cases to the United Nations over the Cheonan sinking recently, with South Korea urging the Security Council to take "timely and appropriate measures." North Korea's envoy said that if the "Security Council releases any documents against us, condemning or pressuring us ... then myself as diplomat, I can do nothing. ... The follow-up measures will be carried out by our military forces." The U.S. Congress on Thursday recognized the war anniversary and paid tribute to veterans, noting that 37,000 U.S. soldiers died in the war and around 8,000 were reported missing. Around 28,000 U.S. troops are now stationed in South Korea. On Friday, more than 2,500 people gathered at Washington's National Mall to watch a performance by a Korean children's folk ballet in honor of U.S. veterans of the conflict. Although many of "those brave soldiers are no longer physically with us, they remain with us in spirit," said Bo Hi Pak, head of the Korean War 60th Anniversary Memorial Project. The performance, which included renditions of "America the Beautiful" and "God Bless America," was attended by former U.S. House Speaker Dennis Hastert and South Korean Ambassador to the United States Han Duk-Soo, among others. The causes of the Korean War stem back to the 1940s, when the 38th parallel division of Korea occurred and the two newly formed countries became ideologically opposite, with the North as communist and the South as capitalist. North Korea invaded the South in 1950 to achieve its goal of Korean unification under communist rule. Eventually both the United States and China became involved and the fighting eventually ground to a stalemate.